The VM-212 valve microphone, is designed around the famous AKG C12 microphone. Each model is assembled by hand and has a "Custom" finish, to the clients requirements. Together with the VP-120/6-RV power supply, the VM-212 is capable of "Recreating" that magical AKG C12 sound. By virtue of the microphone/power supply design, this combination of components has the ability to capture the "Space" between the music. Again, this is something that made AKG C12 so popular. For further details, please see "Design and Construction". 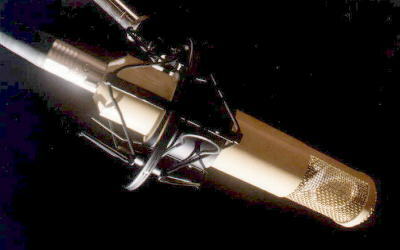 The VM-951 valve microphone, finished in "British Racing Green", is the same in appearance as the VM-212. The VM-951, uses a capsule "Similar" to that of the original CK12 type, which is assembled/tuned on-site. A "Selected" low noise "Pentode" valve, is utilized for Impedance conversion. This combination of components, along with a very large matching transformer, enables the microphone to capture the weight/force, of the sound produced by Drum Kit's, Big Bands, etc.